The ratio stress/strain remain constant for small deformation of a metal wire. When the deformation is made larger, will this ratio increase or decrease? The ratio of stress to strain will decrease. Beyond the elastic limit, the body loses its ability to restore completely when subjected to stress. Thus, there occurs more strain for a given stress. At some points, however, the body undergoes strain without the application of stress. So, the ratio of stress to strain decreases. Let the CSA of the wire be A. 12Mgl is converted into kinetic energy of the mass. When the mass leaves its initial point on the spring, it acquires a velocity as it moves down. The velocity reaches its maximum at the end point. The spring oscillates. Finally, when the kinetic energy is dissipated into heat, the spring comes to rest. When the skeleton of an elephant and the skeleton of a mouse are prepared in the same size, the bones of the elephant are shown thicker than those of the mouse. Explain why the bones of an elephant are thicker than proportionate. The bones are expected to withstand the stress due to the weight of the animal. The elephant has a greater weight than a mouse, but the material that makes their bones is the same. This means that in order to sustain an elephant’s weight, one’s bones need to suffer less stress. Stress = Force/area. A greater cross-sectional area reduces stress on the bones. This is why an elephant’s bones are thicker. The yield point of a typical solid is about 1%. Suppose you are lying horizontally and two persons are pulling your hands and two persons are pulling your legs along your own length. How much will be the increase in your length if the strain is 1%? Do you think your yield point is 1% or much less than that? =lL=1100⇒l=L100So, the increase in length will be L100.Yes, the yield point is much less than the 1% strain because the human body consists of joints and not one uniform solid structure. When rubber sheets are used in a shock absorber, what happens to the energy of vibration? The energy of vibration dissipates as heat from the shock absorber. If a compressed spring is dissolved in acid, what happened to the elastic potential energy of the spring? When a compressed spring dissolves in an acid, the acid molecules leave the sold lattice of the spring faster than the uncompressed spring. This in turn increases the kinetic energy of the solution. As a result, the temperature of the acid also increases. However, this temperature increase will be very small because the mechanical energy content in the spring is lesser than its chemical energy content. A steel blade placed gently on the surface of water floats on it. If the same blade is kept well inside the water, it sinks. Explain. It floats because of the surface tension of water. The surface of water behaves like a stretched membrane. When a blade is placed on the water surface, it’s unable to pierce the stretched membrane of water due to its low weight and remains floating. However, if the blade is placed below the surface of water, it no longer experiences the surface tension and sinks to the bottom as the density of the blade is greater than that of water. When some wax is rubbed on a cloth, it becomes waterproof. Explain. A liquid wets a surface when the angle of contact of the liquid with the surface is small or zero. Due to its fibrous nature, cloth produces capillary action when in contact with water. This makes clothes have very small contact angles with water. When wax is rubbed over cloth, the water does not wet the cloth because wax has a high contact angle with water. The contact angle between pure water and pure silver is 90°. If a capillary tube made of silver is dipped at one end in pure water, will the water rise in the capillary? No, the water will neither rise nor fall in the silver capillary. According to Jurin’s law, the level of water inside a capillary tube is given byh=2TcosθrρgHere, θ = 900⇒h =2Tcos900rρg ⇒h=0Thus, the water level neither rises nor falls. It is said that a liquid rises or is depressed in capillary due to the surface tension. If a liquid neither rises nor depresses in a capillary, can we conclude that the surface tension of the liquid is zero? No, we cannot conclude the surface tension to be zero solely by the fact that the liquid neither rises nor falls in a capillary. The contact angle between water and glass is 0°. When water is poured in a glass to the maximum of its capacity, the water surface is convex upward. The angle of contact in such a situation is more than 90°. Explain. When water is poured in a glass, it reaches the brim and rises further. The edge of the glass lies below the water level. In this case, the force of attraction due to molecules of the glass surface is not perpendicular to the solid. Here, the contact angle can be greater than the standard contact angle for a pair of substances. A uniform vertical tube of circular cross section contains a liquid. The contact angle is 90°. Consider a diameter of the tube lying in the surface of the liquid. The surface to the right of this diameter pulls the surface on the left of it. What keeps the surface on the left in equilibrium? As the angle of contact is 0, there is no force between the surface of the tube and the liquid. The diameter of the liquid surface is pulled on both sides by equal and opposite forces of surface tension. This results in no net force remaining on the surface of the liquid. Hence, the liquid stays in equilibrium. When a glass capillary tube is dipped at one end in water, water rises in the tube. The gravitational potential energy is thus increased. Is it a violation of conservation of energy? No, it does not violate the principle of conservation of energy. There is a force of attraction between glass and water, which is why the liquid rises in the tube. However, when water and glass are not in contact, there exists a potential energy in the system. When they are brought into contact, this potential energy is first converted into kinetic energy, which lets the liquid rush upwards in the tube, and then into gravitational potential energy. Therefore, energy is not created in the process. If a mosquito is dipped into water and released, it is not able to fly till it is dry again. Explain. A mosquito thrown into water has its wings wetted. Now, wet wing surfaces tend to stick together because of the surface tension of water. This does not let the mosquito fly. The force of surface tension acts tangentially to the surface whereas the force due to air pressure acts perpendicularly on the surface. How is then the force due to excess pressure inside a bubble balanced by the force due to the surface tension? The forces act tangentially to the bubble surface on both sides of a given line but they have one component normal to the bubble surface. This component balances the force due to excess pressure inside the bubble. In the figure, let us consider a small length AB on the surface of the spherical bubble. 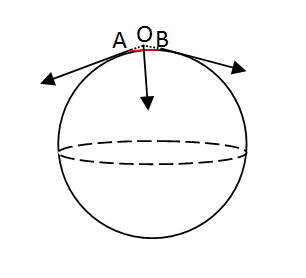 Let the surface forces act tangentially along A and B. On producing the forces backwards, they meet at a point O. By the parallelogram law of forces, we see that the resultant force acts opposite to the normal. This balances the internal forces due to excess pressure. When the size of a soap bubble is increased by pushing more air in it, the surface area increases. Does it mean that the average separation between the surface molecules is increased? No. The average intermolecular distances do not increase with an increase in the surface area. A soap bubble’s layer consists of several thousand layers of molecules. An increase in the surface area causes the surface energy to also increase. This in turn allows more and more molecules from the inner liquid layers of the bubble to attain potential energy, enabling them to enter the outer surface of the bubble. Hence, the surface area increases. Frictional force between solids operates even when they do not move with respect to each other. Do we have viscous force acting between two layers even if there is no relative motion? No. For a liquid at rest, no viscous forces exist. Viscous forces oppose relative motion between the layers of a liquid. These layers do not exist in a liquid that is at rest. Therefore, it is obvious that viscous forces are non-existent in a static liquid. Water near the bed of a deep river is quiet while that near the surface flows. Give reasons. The motion of any liquid is dependent upon the amount of stress acting on it. The motion of one layer of liquid is resisted by the other due to the property of viscosity. A river bed remains in a static state. Therefore, any immediate layer of liquid in contact with the river bed will also remain static due to the frictional force. However, the next layer of liquid above this static layer will have a greater velocity due to lesser resistance offered by the static layer. Moving upwards, subsequent layers provide lesser and lesser resistance to the movement of the layers above it. Finally, the topmost layer acquires the maximum velocity. Therefore, for a river, the surface waters flow the fastest. If water in one flask and castor oil in other are violently shaken and kept on a table, which will come to rest earlier? Castor oil will come to rest more quickly because it has a greater coefficient of viscosity than water. Castor oil has a higher viscosity than water. It will therefore, lose kinetic energy and come to rest faster than water. (d) shape of he cross section. Breaking stress depends upon the intermolecular/ inter-atomic forces of attraction within materials. In other words, it depends upon the material of the wire. As the wire is cut into two equal parts, both have equal cross-sectional areas. Therefore, a weight of 20 kg exerts a force of 20g on both the pieces. Breaking stress depends upon the material of the wire. Since 20g of force is exerted on wires with equal cross-sectional areas, both the wires can sustain a weight of 20 kg. (d) maximum in the middle. As the rod is of uniform mass distribution and stretched by its own weight, the topmost part of the rod experiences maximum stress due to the weight of the entire rod. This stress leads to lateral strain and the rod becomes thinner. Moving down along the length of the rod, the stress decreases because the lower parts bear lesser weight of the rod. With reduced stress, the lateral strain also reduces. Hence, the diameter of the rod gradually increases from top to bottom. C.S.A. = ALength = lVolume of the wire V = AlAssuming no lateral strain when longitudinal strain occurs:Increase in volume: ∆V= A∆l ⇒ ∆V V=A∆lAl=∆llSo, ∆V V is directly proportional to ∆ll. (d) at an angle of cos−1(1/3) from the upward vertical. If the velocity of the mass is a maximum at the bottom, then the string experiences tension due to both the weight of the mass and the high centrifugal force. Both these factors weigh the mass downwards. The tension is therefore, maximum at the lowest point, causing the string to most likely break at the bottom. When a metal wire elongates by hanging a load on it, the gravitational potential energy is decreased. (a) This energy completely appears as the increased kinetic energy of the block. (c) This energy completely appears as heat. None of these is the correct option. The decreased gravitational potential energy transforms partly as elastic energy, partly as kinetic energy and also in the form of dissipated heat energy. As the ice cube melts completely, the water thus formed will have minimum surface area due to its surface tension. Any state of matter that has a minimum surface area to its volume takes the shape of a sphere. Therefore, as the ice melts, it will take the shape of a sphere. (d) energy may either be liberated or absorbed depending on the nature of the liquid. As the water droplets merge to form a single droplet, the surface area decreases. With this decrease in surface area, the surface energy of the resulting drop also decreases. Therefore, extra energy must be liberated from the drop in accordance with the conservation of energy. When air is pushed into the bubble, it grows in size. Therefore, its radius increases. An increase in size causes the pressure inside the soap bubble to decrease as pressure is inversely proportional to the radius. (d) there is no flow of air. The smaller bubble has a greater inner pressure than the bigger bubble. Air moves from a region of high pressure to a region of low pressure. Therefore, air moves from the smaller to the bigger bubble. Let the excess pressure inside the second bubble be P.
Let the radius of the second bubble be R.
Let the radius of the first bubble be x. Which of the following graphs may represent the relation between the capillary rise h and the radius r of the capillary? The relationship between height h and radius r is given by:h=2ScosθrρgIf S, θ, ρ and g are considered constant, we have:h∝1rThis equation has the characteristic of a rectangular hyperbola. Therefore, curve (c) is a rectangular hyperbola. Height of water column in capillary tube is given by:h= 2Tcosθ rρgA free falling elevator experiences zero gravity.⇒ h = 2Tcosθ rρ0=∞But, h = 20 cm (given)Therefore, the height of the water column will remain at a maximum of 20 cm. (d) liquids and gases only. Viscosity is one property of fluids. Fluids include both liquids and gases. The force of viscosity arises from molecular interaction between different layers of fluids that are in motion. Molecular forces are electromagnetic in nature. Therefore, viscosity must also be electromagnetic. The viscous force acts tangentially between two parallel layers of a liquid. In terms of force on a material, it is analogous to a shearing force. (d) the drops are charged and atmospheric electric field balances its weight. Air has viscosity. During rainfall, the raindrops acquire acceleration due to gravity. However, the increase in velocity is hindered by the viscous force acting upwards. A gradual balance between the two opposing forces causes the raindrops to attain a terminal velocity, thus, falling with a uniform velocity. The density of wood is less than that of water.When a piece of wood is immersed deep inside a long column of water and released, it experiences a buoyant force that gives it an upward acceleration. The velocity of wood increases as its motion is accelerated by the buoyant force. However, the viscous drag force acts simultaneously to oppose its upward motion. As a result, the initial acceleration decreases and the wood rises with a decreasing upward acceleration. In vacuum, no viscous force exists. The sphere therefore, will have constant acceleration because of gravity. An accelerated motion implies that it won’t have uniform velocity throughout its motion. In other words, there will be no terminal velocity. Initially, when the ball starts moving, its velocity is small. Gradually, the velocity of the ball increases due to acceleration caused by gravity. However, as the velocity increases, the viscous force acting on the ball also increases. This force tends to decelerate the ball. Therefore, after reaching a certain maximum velocity, the ball slows down. (d) length increased and the weight hung. (a) When a weight is loaded on a wire, the length of the wire increases. The relationship between weight and length is linear. (b) When a weight is loaded, it produces stress on the wire. The relationship between stress and increase in length is also linear. (c) When stress is applied, strain develops. Therefore, both are linearly related. (d) Since the value of Y for the wire is unknown, X may also be the increase in its length. Nevertheless, they still show the same linear relationship. (d) feel a net force in one direction. (c) The surface molecules acquire air and liquid molecules in their sphere of influence. (d) The surface molecules have different magnitudes of forces pulling them from the top and the bulk. So, they are affected by a net finite force in one direction. Height of the liquid in the capillary tube is given by:h = 2Scosθrρgh = HeightS = Surface tensionr =Inner radius of the tubeρ= Density of the liquidg = Acceleration due to gravitya) θ and ρ depend upon the material of the capillary tube and the liquid.b) h is dependent on the length of the tube. If the length is insufficient, then h will be low.d) r is the inner radius of the tube. The angle of contact between a solid and a liquid depends upon the molecular forces of both the substances. Therefore, it depends upon the material of the solid and the liquid. Let the height of the liquid-filled column be L.
Let the radius be denoted by R.
When a capillary tube is dipped into a liquid, the liquid neither rises nor falls in the capillary. (a) The surface tension of the liquid must be zero. (b) The contact angle must be 90°. (c) The surface tension may be zero. (d) The contact angle may be 90°. If the liquid level does not rise, it may be assumed that the surface tension is zero or the contact angle is 90°, or both. However, we cannot tell for sure whether the surface tension of the liquid is zero or the contact angle is 0°. A solid sphere moves at a terminal velocity of 20 m s−1 in air at a place where g = 9.8 m s−2. The sphere is taken in a gravity-free hall having air at the same pressure and pushed down at a speed of 20 m s−1. (a) Its initial acceleration will be 9.8 m s−2 downward. (b) It initial acceleration will be 9.8 m s−2 upward. (c) The magnitude of acceleration will decrease as the time passes. (b) There is no gravitational force acting downwards. However, when the starting velocity is 20 m/s, the viscous force, which is directly proportional to velocity, becomes maximum and tends to accelerate the ball upwards. (c) The velocity of the ball will decrease with time because of the upward viscous drag. As the force of viscosity is directly proportional to the velocity of the ball, the acceleration due to the viscous force will also decrease. (d) When all the kinetic energy of the ball is radiated as heat due to the viscous force, the ball comes to rest. A load of 10 kg is suspended by a metal wire 3 m long and having a cross-sectional area 4 mm2. Find (a) the stress (b) the strain and (c) the elongation. Young modulus of the metal is 2.0 × 1011 N m−2. A vertical metal cylinder of radius 2 cm and length 2 m is fixed at the lower end and a load of 100 kg is put on it. Find (a) the stress (b) the strain and (c) the compression of the cylinder. Young modulus of the metal = 2 × 1011 N m−2. The elastic limit of steel is 8 × 108 N m−2 and its Young modulus 2 × 1011 N m−2. Find the maximum elongation of a half-metre steel wire that can be given without exceeding the elastic limit. Elastic limit of steel FA=8×105 N/m2Young’s modulus of steel Y=2×1011 N/m2Length of steel wire L=12m=0.5 mThe elastic limit of steel indicates the maximum pressure that steel can bear. Y=FA L∆L⇒∆L=FLAY⇒∆L=8×105×0.52×1011 =2×10-3 m=2 mmHence, the required elongation of steel wire is 2 mm. A steel wire and a copper wire of equal length and equal cross-sectional area are joined end to end and the combination is subjected to a tension. Find the ratio of (a) the stresses developed in the two wires and (b) the strains developed. Y of steel = 2 × 1011 N m−2. Y of copper = 1.3 × 10 11 N m−2. Both wires are of equal length and equal cross-sectional area. Also, equal tension is applied on them. Lsteel=LCuAsteel=ACuFCu=FSteelHere: Lsteel and LCu denote the lengths of steel and copper wires, respectively. Asteel and ACu denote the cross-sectional areas of steel and copper wires, respectively. Fsteel and FCu denote the tension of steel and cooper wires, respectively. Strain of CuStrain of steel = ∆LSteelLSteel∆LcuLcu=FSteel LSteel Acu YcuASteel YSteel Fcu Lcu Using ∆LL=FAY⇒Strain of CuStrain of steel=YcuYSteel=1.3×10112×1011⇒Strain of CuStrain of steel=1320⇒Strain of steelStrain of Cu=2013Hence, the required ratio is 20 : 13. In figure the upper wire is made of steel and the lower of copper. The wires have equal cross section. Find the ratio of the longitudinal strains developed in the two wires. the block applies equal tension on both of them. Strain of CuStrain of steel = ∆LSteelLSteel∆LcuLcu=FSteel LSteel Acu YcuASteel YSteel Fcu Lcu Using ∆LL=FAY⇒Strain of CuStrain of steel=YcuYSteel=1.3×10112×1011⇒Strain of steel Strain of Cu=2013=1.54Hence, the required ratio of the longitudinal strains is 20 : 13.
same material which has a breaking stress of 8 × 108 N m−2. The area of cross section of the upper wire is 0.006 cm2 and that of the lower wire is 0.003 cm2. The mass m1 = 10 kg, m2 = 20 kg and the hanger is light. (a) Find the maximum load that can be put on the hanger without breaking a wire. Which wire will break first if the load is increased? (b) Repeat the above part if m1 = 10 kg and m2 = 36 kg. ⇒m2 g+m1g+wAu=8×108⇒w=180 N or 18 kgFor the same breaking stress, the maximum load that can be put is 140 N or 14 kg. The lower wire will break first if the load is increased. ⇒TuAu=m2g+m1g+wAu=8×105⇒w=20 NFor the same breaking stress, the maximum load that can be put is 20 N or 2 kg. The upper wire will break first if the load is increased. Two persons pull a rope towards themselves. Each person exerts a force of 100 N on the rope. Find the Young modulus of the material of the rope if it extends in length by 1 cm. Original length of the rope = 2 m and the area of cross section = 2 cm2. A steel rod of cross-sectional area 4 cm2 and 2 m shrinks by 0.1 cm as the temperature decreases in night. If the rod is clamped at both ends during the day hours, find the tension developed in it during night hours. Young modulus of steel = 1.9 × 1011 N m−2. Let the tension developed at night be F.
Y=FA×L∆L⇒F=YA∆LL =1.9×1011×4×10-4×10-32 =3.8×104 N∴ Required tension developed in steel rod during night hours = 3.8 × 104 N.
Consider the situation shown in figure. The force F is equal to the m2g/2. If the area of cross section of the string is A and its Young modulus Y, find the strain developed in it. The string is light and there is no friction anywhere. Let a be the acceleration produced in block m2 in the downward direction and T be the tension in the string. A sphere of mass 20 kg is suspended by a metal wire of unstretched length 4 m and diameter 1 mm. When in equilibrium, there is a clear gap of 2 mm between the sphere and the floor. The sphere is gently pushed aside so that the wire makes an angle θ with the vertical and is released. Find the maximum value of θ so that the sphere does not rub the floor. Young modulus of the metal of the wire is 2.0 × 1011 N m−2. Make appropriate approximations. When it is moved at an angle θ and released, let the tension at the lowest point be T‘â€‹. ⇒T’=mg+mv2rThe change in tension is due to the centrifugal force. ∆T=m 2gr1-cosθr =2mg1-cosθ Now, F=∆TAlso, F=YA∆LL⇒YA∆LL=2mg1-cosθ⇒cosθ=1-YA∆LL2mg⇒cosθ=1-2×1011×4×3.14×52×10-8×2×10-34×2×20×10⇒cosθ=0.80Or, θ=36.4°Hence, the required maximum value of θ is 35.4Ëš. A steel wire of original length 1 m and cross-sectional area 4.00 mm2 is clamped at the two ends so that it lies horizontally and without tensions. If a load of 2.16 kg is suspended from the middle point of the wire, what would be its vertical depression? Y of the steel = 2.0 × 1011 N m−2. Take g = 10 m s−2. 2Tcosθ=mg2Tx50=2.16×103×980⇒2×2×1012×4×10-2×2502+x2 12-100×100×50=2.16×103×980On solving the above equation, we get x = 1.5 cm. Hence, the required vertical depression is 1.5 cm. A copper wire of cross-sectional area 0.01 cm2 is under a tension of 20N. Find the decrease in the cross-sectional area. Young modulus of copper = 1.1 × 1011 N m−2 and Poisson ratio = 0.32. Find the increase in pressure required to decrease the volume of a water sample by 0.01%. Bulk modulus of water = 2.1 × 109 N m−2. 2.1×109 Nm-2In order to decrease the volume (V) of a water sample by 0.01%, let the increase in pressure be P.
Estimate the change in the density of water in ocean at a depth of 400 m below the surface. The density of water at the surface = 1030 kg m−3 and the bulk modulus of water = 2 × 109 N m−2. A steel plate of face area 4 cm2 and thickness 0.5 cm is fixed rigidly at the lower surface. A tangential force of 10 N is applied on the upper surface. Find the lateral displacement of the upper surface with respect to the lower surface. Rigidity modulus of steel = 8.4 × 1010 N m−2. Let θ be the angular displacement. Hence, the required lateral displacement of the steel plate is 1.5 × 10−9 m.
A 5.0 cm long straight piece of thread is kept on the surface of water. Find the force with which the surface on one side of the thread pulls it. Surface tension of water = 0.076 N m−1. Therefore, the water surface on one side of the thread pulls it with a force of 3.8 × 10−3 N.
Find the excess pressure inside (a) a drop of mercury of radius 2 mm (b) a soap bubble of radius 4 mm and (c) an air bubble of radius 4 mm formed inside a tank of water. Surface tension of mercury, soap solution and water are 0.465 N m−1, 0.03 N m−1 and 0.076 N m−1 respectively. Consider a small surface area of 1 mm2 at the top of a mercury drop of radius 4.0 mm. Find the force exerted on this area (a) by the air above it (b) by the mercury below it and (c) by the mercury surface in contact with it. Atmospheric pressure = 1.0 × 105 Pa and surface tension of mercury = 0.465 N m−1. Neglect the effect of gravity. Assume all numbers to be exact. The capillaries shown in figure have inner radii 0.5 mm, 1.0 mm and 1.5 mm respectively. The liquid in the beaker is water. Find the heights of water level in the capillaries. The surface tension of water is 7.5 × 10−2 N m−1. The lower end of a capillary tube is immersed in mercury. The level of mercury in the tube is found to be 2 cm below the outer level. If the same tube is immersed in water, up to what height will the water rise in the capillary? Let T be the surface tension, r be the inner radius of the capillary tube and ρ be the density of the liquid. Hence, the required rise in the water level in the capillary tube is 4.38 cm. ° and surface tension of mercury = 0.465 N m−1. Density of mercury = 13600 kg m−3. Let h be the rise in level in the barometer. A capillary tube of radius 0.50 mm is dipped vertically in a pot of water. Find the difference between the pressure of the water in the tube 5.0 cm below the surface and the atmospheric pressure. Surface tension of water = 0.075 N m−1. =490-300=190 N/m2Hence, the required difference in pressure is 190 N/m2. Find the surface energy of water kept in a cylindrical vessel of radius 6.0 cm. Surface tension of water = 0.075 J m−2. Therefore, the surface energy of water kept in a cylindrical vessel is 8.5 × 10−4 J. A drop of mercury of radius 2 mm is split into 8 identical droplets. Find the increase in surface energy. Surface tension of mercury = 0.465 J m−2. Let the radius of a small drop of mercury be r.
Hence, the required increase in the surface energy of the mercury droplets is 23.4 μJ. A capillary tube of radius 1 mm is kept vertical with the lower end in water. (a) Find the height of water raised in the capillary. (b) If the length of the capillary tube is half the answer of part (a), find the angle θ made by the water surface in the capillary with the wall. (a) Let T be the surface tension and ρ be the density of the liquid. (b) Let the new length of the tube be h’. h’=2Tcos θrρgcos θ=h’rρg2TUsing equation i, we get:cos θ=h’h=12 Because h’=h2⇒ θ=cos-112=60°The water surface in the capillary makes an angle of 60âˆ˜with the wall. Let ρ be the density of mercury. Let the new contact angle of mercury with glass be θ’. Two large glass plates are placed vertically and parallel to each other inside a tank of water with separation between the plates equal to 1 mm. Find the rise of water in the space between the plates. Surface tension of water = 0.075 Nm−1. ⇒h=2×0.07510-3×103×10 =0.015 m = 1.5 cmTherefore, the rise of water in the space between the plates is 1.5 cm. Consider an ice cube of edge 1.0 cm kept in a gravity-free hall. Find the surface area of the water when the ice melts. Neglect the difference in densities of ice and water. The water that is formed due to the melting of ice acquires a spherical surface. In the absence of gravity, let the radius of the spherical surface be r.
A wire forming a loop is dipped into soap solution and taken out so that a film of soap solution is formed. A loop of 6.28 cm long thread is gently put on the film and the film is pricked with a needle inside the loop. The thread loop takes the shape of a circle. Find the tension the the thread. Surface tension of soap solution = 0.030 N m−1. Let the radius of the thread loop be r.
A metal sphere of radius 1 mm and mass 50 mg falls vertically in glycerine. Find (a) the viscous force exerted by the glycerine on the sphere when the speed of the sphere is 1 cm s−1, (b) the hydrostatic force exerted by the glycerine on the sphere and (c) the terminal velocity with which the sphere will move down without acceleration. Density of glycerine = 1260 kg m−3 and its coefficient of viscosity at room temperature = 8.0 poise. Let V be the volume of the sphere. Let the terminal velocity of the sphere be v’. Estimate the speed of vertically falling raindrops from the following data. Radius of the drops = 0.02 cm, viscosity of air = 1.8 × 10−4 poise, g= 9.9 × 10 ms−2 and density of water = 1000 kg m−3. Let v be the terminal velocity of a drop. Because the density of air is very small, the force of buoyance can be neglected. =2×0.02×10-22×1000×9.99×1.8×10-5= 5 m/s.Hence, the required vertical speed of the falling raindrops is 5 m/s. Water flows at a speed of 6 cm s−1 through a tube of radius 1 cm. Coefficient of viscosity of water at room temperature is 0.01 poise. Calculate the Reynolds number. Is it a steady flow? Let the Reynolds number be R and the density of water be ρ. ⇒R=vpDη =6×10-3×103×2×10-210-2 =120Here, the Reynolds number is less than 2000. Therefore, it is a steady flow.